Jean F. Bernau, age 75, of McHenry, passed away peacefully on Thursday, January 18, 2018. 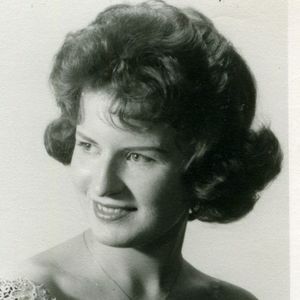 She was born on October 30, 1942, to the late Frank and Janet (nee Schroeder) Barrett. On November 21, 1964, she married the love of her life, Terrence Bernau. Jean loved to paint and make floral arrangements. Most of all though, she enjoyed doting on her grandchildren. She will be greatly missed by all who knew her. She is survived by her children: Jeffrey (Michelle) Bernau and Kelli (John) Doubek; and grandchildren: Sergey, Nicholas, Aiden, and Abigail. In addition to her parents, Jean was preceded in death by her husband Terrence. Visitation will be held from 8:30am until time of Funeral Mass at 10am on Tuesday, January 23, 2018, at Church of Holy Apostles, 5211 Bull Valley Road, McHenry. Interment will follow in the church cemetery. In lieu of flowers, memorials in Jean's name may be made to St. Labre Indian School, Ashland, Montana 59004.